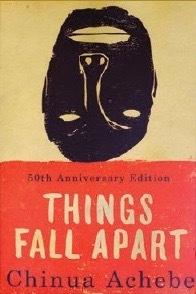 Composed in English and published in 1958, two years before Nigeria declared independence, Things Fall Apart was the first African novel to attain a wide international readership. It is a short, sparely told tale that nevertheless embraces themes of enormous import: fate and will, the determining influences of familial inheritance, the consequences and consolations of custom, the legacy of colonialism. It also illuminates the personal and political crises provoked by the failure of individuals and societies to grow while maintaining their identities in the face of change. And while the novel is steeped in Achebe’s native Igbo culture and alert to the conflicts inherent in the historical moment it depicts, its action seems to unfold on a universal stage; it is as rich in human substance as Greek tragedy, and just as mysteriously powerful in its effect. We all need to learn about and understand different cultures...even if through novels. This is as good an entrance into African literature as exists. Inspiring core reading from a Postcolonial Geography module I took in the final year of my degree.